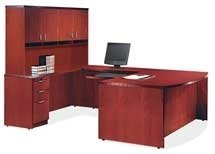 We can supply all your office furniture needs with a wide variety of fine products and prices.We are proud to serve businesses within a 90 mile radius with design, installation, and product support. Below, you will find a small portion of our offerings. 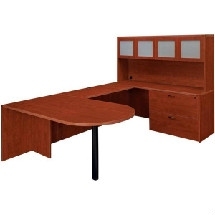 There is no pricing because all desks can be furnished with different options. 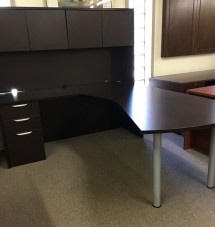 Desk and return set. Available in in either Cherry or Mahogany Veneer. Receptionist desk set. Available in 5 colors: Cherry, Mahogany, Honey, Espresso, and Modern Walnut. Different sizes available. Receptionist desk set. Available in 5 colors: Cherry, Mahogany, Honey, Espresso, and Modern Walnut. 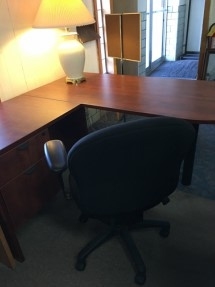 L SHAPED DESK AND RETURN. Return is reversible. Many different sizing options. Available in 5 colors: Cherry, Mahogany, Honey, Espresso, and Modern Walnut. Rue De Lyon Collection. Comes in ruby cabernet finish. For the elegant office. 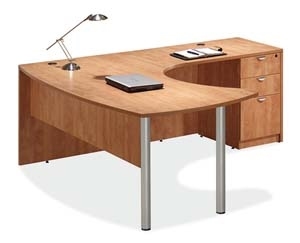 Contemporary Veneer Executive Desk Set featuring a reeded edge detail. Available colors are Cherry and Mahogany. Cherry L Shape. 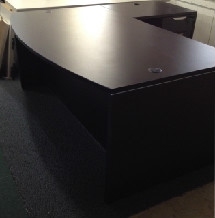 Desk 30x66. D Shape with Return in Espresso. NEW Cherry Bullet L Shape. 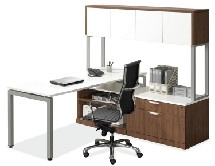 Price - $449.99 HON Maple L Shape, Modular Work Station. 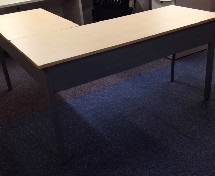 Desk 60x24, Return 36x24. NEW - $289.99 S O L D!!! Espresso U Shape Desk. With Silver Pulls and Glass Doors. Very Sharpe! Very Popular!! !